The Wests Tigers’ thumping 46-6 loss to the Canberra Raiders appears to have been the straw that broke the camel’s back, with Jason Taylor officially sacked as the club’s head coach. The Daily Telegraph initially reported that Taylor could be sacked in 24 hours, but the club released a statement saying it is effective immediately. There were rumours that several players were unhappy with Taylor in charge and were refusing to sign new contracts until he left. It’s been a difficult few months for Taylor and the Tigers in general, after the much publicised feud with Robbie Farah last year. The Tigers just missed out on making the finals in 2016 and are languishing in last spot after three rounds of the 2017 season, having conceded 100 points. Current Wests Tigers assistant coach Andrew Webster will take over as interim head coach. 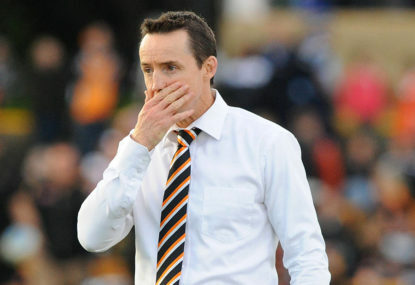 Wests Tigers have today announced the termination of the contract of Head Coach Jason Taylor, effective immediately. Wests Tigers Chair Marina Go said that this decision was not an easy one for the Club to make. “On behalf of everyone at Wests Tigers I’d like to thank Jason for his commitment and contribution to the Club during his time as Head Coach,” said Go. “Jason has overseen significant change within the Club over the past two seasons and we thank him for his efforts. “Our position has always been to make sure that the Head Coach’s contract is tied to performance and that hasn’t changed,” she said. “We are committed to building a side that will be in a position to win NRL Premierships and believe that this decision is the correct one for the future of the Club. “This is a challenging time for the Club and Jason and we ask that we are given time to work through this process with Jason,” said Go. Current Wests Tigers Assistant Coach Andrew Webster will take on the role of Interim Head Coach. Webster returned to Wests Tigers this year after spending two seasons as an Assistant Coach at the New Zealand Warriors.